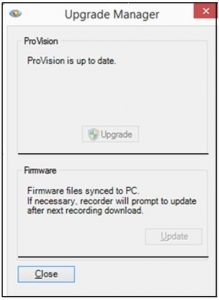 Recent versions of ProVision include the Upgrade Manager which allows the user an easy way to ensure that the ProVision software and the recorder firmware are up-to-date. The Upgrade Manager is displayed when ProVision is started. Selecting the Upgrade button, when a new ProVision version is available, will close, update and reopen Provision. Selecting the Update button, will copy the firmware files to your PC. To hide the Upgrade Manager, select the Menu Options tab and Preferences, then de-select ‘Check for Updates on Startup’. The Upgrade Manager can be manually opened by selecting the Menu Help tab and ‘Check for Updates’.